Over the last couple of weeks I’ve been debating whether to do a round up of 2013. I like reading round up posts, it’s nice to see how people have felt about their year. Also, there’s something cathartic about summing it all up; it packages everything up to be stowed away for (possible) future reading and remembering. This time I’ve got a case of the ‘don’t wannas’. My knitting output was minimal, and outside of knitting there’s just some happenings that I’m not ready to think or write about. So instead of an end of year review, I’m going to postpone any reviewing until July(ish), which will mark one year since the start of a year of vintage knitting. It’s quite a convenient way to procrastinate, but I’m using it. I’ve still got a couple of FOs waiting for their moment in the bloggy sun, but before I get around to that, here are the projects that have followed me into the new year. 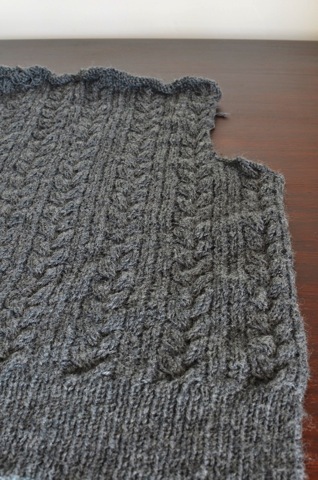 I cast on Tri-Cable Stitch Jumper from A Stitch In Time Volume 2 as soon as Variation on Cable Stitch was done. It’s got all the hallmarks of a slow knit, with all its cables and ribbing and 4ply yarn and small(ish) needles, but it’s flown off the needles. A lot of that has to do with the yarn, Patons Dreamtime 4ply, which is pretty much the perfect charcoal grey and a delight to look at. It’s a surprising colourway for a yarn that I thought was a baby yarn, but I’m not complaining. The button bands for the front pieces are knit with the front piece, which has caused this weird little lip at the bottom of the piece. It’s a little bit annoying but I think I’ll learn to live with it. The other project I’m working on at the moment is a dolman sleeve cardigan from Lee Target (pattern available from Skiff Knitting). The yarn I’m using for this projects is some rusty 8ply pure alpaca Matt’s mum gave me a few years ago. 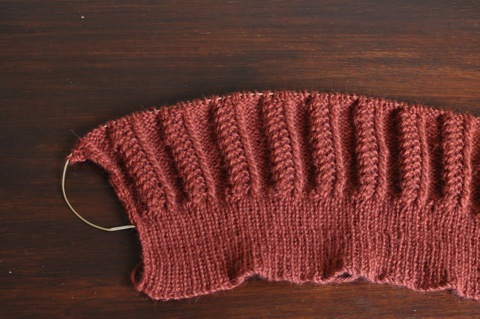 The pattern is easy to remember but requires enough concentration that it’s not really autopilot knitting. It’s knitting up pretty quickly at the moment, but the combination of yarn and stitch pattern means it’s difficult to count rows to space increase rows correctly. Luckily, I know of a good row counter to do the remembering for me. I really like the colour and how the pattern’s coming up in this yarn, but there’s the quiet concern about how it’ll hold up once it’s finished. There’s no doubt that it’ll pill like the dickens, but given it’s alpaca, I’m somewhat concerned about how much it’ll drop. I’ve mitigated that risk a little by knitting it at a tighter gauge, but time will tell how well it’ll wear. There’s one more project that I’m working on, but it’s within a hair’s breadth of being finished so I’ll hold off until it’s done and ready for the great (in the loosest sense of the word) reveal. How have you brought in the start of the year, craft-wise? I love the stitch definition in that bottom photo. I opted out of a year in review type post, I figured everybody had seen every project at least twice and that’s enough! My crafting year has started slowly. I am too tired from a new household routine (we go for a walk at 5am before WM goes to work) and a lack of uninterrupted sleep due to hot weather and the onset of menopause! (too much information, sorry)! I do have a head full of ideas, plans and goals but not enough energy or enthusiasm! As for knitting ,I started a baby hat in late December which I ripped out on 4 January because I didn’t have enough yarn. I can only knit a few rounds at a time — I seem to have developed Knitters’ Elbow (RSI, OOS, whatever it’s called these days)! My self-designed garter stitch log cabin blanket is coming along well, although a couple of hours ago I picked up about 170 stitches in the wrong colour. Luckily I noticed before I finished the pick up row!